The unfortunate reality for those like Kagan who’d like to believe that an incredibly aggressive, violent, coercion-oriented US foreign policy is the height of moral probity is that living conditions around the world are, in general, improving for the better without us. There are major exceptions in Sub-Saharan Africa and North Korea but there’s nothing about a glance at those places — Iraq, Lebanon, the Palestinian territories — that have benefited from American “democracy promotion” policy that would make any sane person think we need to Kaganize our approach to Russia or China. This should not be to say that the U.S. should sit passive, but rather than blowing the entire budgetary and soldierly load on one or two high risk foreign policy extravaganzas, what the U.S. should pursue is multifaceted, low-grade, low risk diplomatic pressure and programs across a wide range of countries and issues. It has a higher probability of success, failures have less consequence and unlike massive military interventions, history is on our side here. Unfortunately foreign policy thinking under the tutelage of George W. Bush, et. al. and the right more generally has taught the country to love the spectacle. The slow, meandering work of diplomacy is no longer enough to capture and hold the imagination of a people who have come to expect “shock and awe,” explosions, daisy-cutter bombs, multi-million dollar airplanes and soldiers looking like a bunch of badasses. No besuited pencil-necks touting human rights reports will suffice for this appetite. In this regard the President and Congress are no longer really strategists who take as their primary object the international situation, so much as senior public relations people involved in the creation of images for mass public consumption. The images then become the raw material of a primal American dialog about manliness, virility, strength, fear, safety, children, et cetera that takes place in an almost entirely solipsistic fantasy world. So the terms of our foreign policy debate have become whether or not a scrawny Greek guy looks convincing driving a tank, how manly George Bush looks in a flight suite and who would be better received serving Thanksgiving dinner at a surprise visit to a FOB. The problem with foreign policy micro-initiatives is that they don’t enter into the symbol system of U.S. political dialogue. But the fundamental problem remains the lopsided distribution of power in the international system. Any country in the same position as the US, even a democracy, would be tempted to exercise its hegemonic power with less and less restraint. America’s founding fathers were motivated by a similar belief that unchecked power, even when democratically legitimated, could be dangerous, which is why they created a constitutional system of internally separated powers to limit the executive. Such a system does not exist on a global scale today, which may explain how America got into such trouble. A smoother international distribution of power, even in a global system that is less than fully democratic, would pose fewer temptations to abandon the prudent exercise of power. A “smoother international distribution of power” could come about through any of a number of ways. The United States could revert to the former system whereby it conducted itself with a self-imposed restraint and voluntarily submitted to a series of treaty-based limitations on its power — ones largely imposed consistently on actors throughout the international system. This would require some measure of calm and circumspection on the part of the U.S. electorate, desiderata for which I am not going to hold my breath. The alternative is that restraint will be imposed upon us by the emergence of a competing power center. The latter is fraught with all the normal dangers of system transition. So hopefully Mr. Fukuyama’s next book will be on the necessity for one world government. S. has recently become very interested in social networking sites and has drug me to get FaceBook and MySpace pages. FaceBook is pretty cool in that it’s like a social networking engine with an API for user application development. Judging by some of the applications, they give developers a lot of access. But the thing that I don’t get is why the people behind FaceBook seem to so lack ambition. First of all, they have yet to completely shed their college-oriented origins, so their network remains entirely too fragmented. But the real oversight is why, with that huge existing user database, they haven’t deployed more core functionality. Right now is seems like FaceBook is just a sort of online business card. Why haven’t they deployed dating, group scheduling and calendaring, blogging, employment, classified advertisements and so on? They could be match.com, meetup.com, livejournal.com, monster.com and craigslist.com all rolled into one. Or if not build the functionality themselves, why not partner and integrate or build some gateways? There are some features like what I am talking about, but they are rudimentary. Why not put them front and center? Seems like a recipe for obsolescence to me. In this environment it’s innovate or wither. S. bought me a lifetime membership to LibraryThing and I found that scanning books into a web database is the perfect distraction from sleep at 2:00 in the morning on a work night. 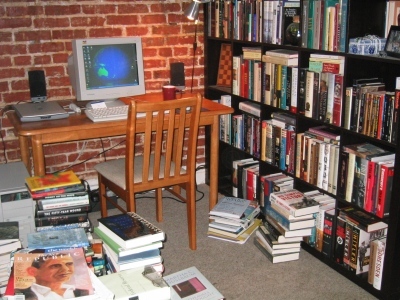 Whenever I had a few minutes I would pull a cubby off the shelf and scan maybe a dozen books at a time. It took a few weeks like this, but soon enough I had the entire collection in. Now if only LibraryThing had a tool to run off Dewey decimal number labels. Here is my collection. It presently stands at 800 volumes. I dread having to move out of my basement apartment. The new place will undoubtedly be a third-floor walk-up and a studio to boot. If any reader with a particularly large collection decides to catalog their books too, I highly recommend the CueCat barcode scanner. It’s cheep, ships quickly and turned a job that could have taken months into one that was only like two weeks of a few minutes each night. Anyway, here’s a picture with most of the back side of the bookshelf to the right still stacked around my PC. It’s also the station where one third of the magic here at This Is Not A Dinner Party happens. Again, the trump argument in the debate over whether the standard predictions of realism, that hegemony always produces a balance, applies as well to Twenty-First Century U.S. unipolarity as it has all other hegemons, is to ask, “Where is the balance?” Realists have been hard-pressed to answer this question and have made recourse to the notion of the “soft balance.” This has evoked a bit of ridicule from their neoconservative opponents, who reply that there is no such thing as soft balancing, or if there is such a thing it doesn’t count. Well, how about last week’s Caspian Sea Leaders Summit for a hard balance (Fathi, Nazila and C. J. Chivers, “In Iran, Putin Warns Against Military Action,” The New York Times, 17 October 2007)? President Vladimir V. Putin of Russia said at a summit meeting of five Caspian Sea nations in Iran on Tuesday that any use of military force in the region was unacceptable. In a declaration, the countries agreed that none would allow their territories to be used as a base for military strikes against any of the others. Later he had a meeting with Iran’s supreme leader, Ayatollah Ali Khamenei, in which he said he had expressed a desire for “deeper” relations between the countries, Reuters reported. The article concedes that, “their statements appeared to have more political than military significance, and were not a departure from the status quo.” It looks to me like a departure from the status quo in so far as while it is not a clear-cut case of hard balancing — there were no mutual defense pacts signed or declarations that an attack on one would be viewed as an attack on all — a couple of states banding together in a show of solidarity to compel the hegemon to back down seems like a pretty far cry from soft balancing too. Dr. Bernard Lewis explained the terrorists’ reasoning this way: “During the Cold War,” Dr. Lewis wrote, “two things came to be known and generally recognized in the Middle East concerning the two rival superpowers. If you did anything to annoy the Russians, punishment would be swift and dire. If you said or did anything against the Americans, not only would there be no punishment; there might even be some possibility of reward, as the usual anxious procession of diplomats and politicians, journalists and scholars and miscellaneous others came with their usual pleading inquiries: ‘What have we done to offend you? What can we do to put it right? '” End quote. This is amazing. In the White House you have a bunch of people who reject the Cold War theory of containment. The issue is slightly muddled when you think that they reject it in favor of some third theory of how to prosecute the war on terrorism, but in fact they reject containment, the strategy pursued by the winning side in the Cold War, in favor of that theory of international relations held by the losing side. I see that the present issue of The Weekly Standard castigates liberals as the stupid faction of U.S. politics (Ceaser, James, “The Stupid Party,” vol. 13, no. 6, 22 October 2007, pp. 22-26), but with such historical geniuses as the present crop of Republicans running the show, where can we go wrong? U.S. foreign policy is in fact becoming much more nasty. To the extent that it is not, it is presently run by people whose objective is to make it more so — people who find at least something to admire in the Soviet conduct of foreign affairs. As a strategy for achieving its objectives, a state can always just amp up the consequences for non-compliance. The success of this strategy will depend on where a state sits on the spectrum of profitability as a power with which to bandwagon. And I say again that this is not an absolute consideration, but one made in a competitive environment. It is something of which a state can get away with more when the alternatives are slim, but not at all when they are many. Whatever the case, there is a point beyond which even bad alternatives start to look acceptable and states pursuing this option should be mindful of the international environment. A state can switch to a policy of no positive inducement, but instead solely of making defiance so costly as to be ruled out by all potential dissenters. Such a policy is one of pure coercion. As a basis for alliance, pure coercion seems a pretty bad one. Hence the rapid dissolution of the Warsaw Pact after the revelation of the hollowness of Soviet power. Pure coercion can only work so long as a state is absolutely feared. A few displays of anything less than omnipotence invite further probes. Now a state faces the dilemma of George Orwell in “Shooting and Elephant”: the logic of the spectacle. Under a system of all cost, no benefit, the search for an alternative will be pretty desperate on the part of the subordinated. The gamble of a state pursuing pure coercion is that it can always and for all time prevent the emergence of alternative security arrangements. As Machiavelli wrote, it is best to be both feared and loved, but if both together are not possible it is best to be feared. The United States in the Twenty-First Century doesn’t necessarily have to choose between being loved and feared, but our foreign policy is dominated by people who have chosen to be feared where no necessity for such a choice was presented. Admiration should be automatic in the right wing mindset, or is a sort of byproduct or side benefit to being feared. Admiration is discounted as a specific objective and consigned to the fates (kind of like conservation: merely a personal virtue). Fear is all. It’s been a sleepless week of some rather arduous posts as well as a long time since the last Friday Cat Blogging. So here is a little Friday frivolousness. Kitty is almost entirely indifferent to human food — eating it at least: if it stinks, he will try to bury it. The one exception, oddly enough, is bread. For some reason he is fanatical about the stuff. He pricks up when it goes out on the table and will launch round after round of attack on a baguette. And it’s not some unknown factor: he wants to eat it. If I pinch off a bunch of buds of bread and lay them out for him, he eagerly chews them down as best a pure carnivore’s fangs will allow. Here he is at last night’s dinner, bellying up to the bread basket like his claim to its content was legitimate and going to go down unharried.